It has been thirty-five years since EM (Effective Microorganisms) was developed. Although originally begun as an alternative technology to pesticides and chemical fertilizers, increasing the density of EM, and continuing its use, has led to soil displaying supernatural power. The yield and quality of crops has far exceeded the limits of the past, people working in the fields have become very healthy, and the people who ate the agricultural products also have become quite healthy. Not only this, but continued use of EM led to cleaner air, nearby water systems being purified, and the revival of a large variety of living creatures. At the same time, pesticide residues in the soil are completely decomposed, harmful heavy metals are made harmless, groundwater also becomes more abundant, and it has become clear that radioactivity disappears with use of EM. Since this is something that cannot be explained by the accepted wisdom of traditional science, EM has for many years been severely bashed, labeled as “ridiculous” and “phony” science. The initial view of the Japan Society of Soil Science and Plant Nutrition, which systematically tried to crush EM, was seen as absurd, and was completely refuted in the Journal of the International Society for Horticultural Science. The fact that radioactive cesium will disappear through use of EM has been proven by the Belarus National Radiation Biology Institute. Beginning with intestinal microorganisms, the function of microorganisms on the conversion force of energy is phenomenal, and the “versatility of EM” I have been claiming as part of an advanced field is becoming generally accepted. However, since this technology runs counter to conventional wisdom, and the mass media fears anti-EM attacks and are thus restricting EM coverage, it is very difficult to disseminate correct information about EM; patient and persistent work by volunteers to spread this information continues. 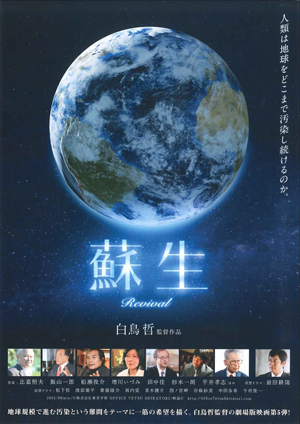 The documentary film SOSEI-Revival is a major force to overcome these barriers, and its being screened all over the world is a historic event that will enlighten people about the philosophy and paradigm of a new regenerative technology, and I would like to express my sincere gratitude to everyone who has helped make it possible. With the development of metagenomic analysis, the reality of microorganisms has become clearer. The human body contains about 30,000 kinds of microorganisms, and is filled with one-hundred trillion microorganisms; in comparison, human DNA is much less than one percent of this number. In other words, human beings are a collection of microorganisms. And not only humans, but everything on earth exists in a veritable sea of microorganisms. This function is called the micro biome (microflora), and this micro biome dominates the environment and health. If this micro biome is of the regenerative type (anti-oxidizing, non-ionizing, converting harmful energy into useful energy) everything will be directed in the desired direction; conversely, if it isn’t, any amount of effort will be useless. From a different perspective, the world of microorganisms is quantum theory-like. That is, if you believe something exists and search for it, you will find it. If you believe it does not exist, you arrive at the epistemology where there is nothing. It has become clear that the technology of effective microorganisms (EM) that I developed thirty-five years ago as an alternative technology to pesticides and chemical fertilizers induces micro biomes in many conditions towards rejuvenation (a collection of good bacteria). It has since been widely used in a variety of fields--in environmental cleanup, primary and secondary industry, medical health, energy savings, and has also achieved convincing results in radioactive contamination measures in Fukushima. that included the result of tests conducted in the field. After this I published A New Earth Saving Revolution in August 2012, a book based on these results. Along with conveying to everyone what is most vitally important in these books, I believe this documentary film provides hints of further evolutionary use of microorganisms, of a higher, more hopeful future society in which we can live in a sustainable, healthful environment where the products we consume are safe and satisfying, of low cost and high-quality.